Jirisan (지리산, 智異山) is a mountain in the southern part of South Korea. 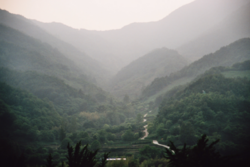 It is often referred to as one of the three mountains of the gods in Korea, along with Hallasan and Kǔmgangsan. Offering stunning views during all four seasons of the year, Jirisan National Park, which surrounds Jirisan, with an area of 471.75 km² that spans three provinces: North and South Jeolla and South Gyeongsang, is South Korea's largest and oldest, having been designated a National Park in 1967. South Gyeongsang province contains the largest portion of the park. The "ji" in the name of Jirisan or Mt. Jiri is the chinese character for wisdom, and it is said that even an ignorant man can become wise by staying on Jirisan. The mountain is sometimes called Duryusan, referring to the spirit of Mt. Baekdu (White-head) which flows down the back of the Baekdudaegan mountain range all the way from the China-Korea border to Jirisan. Another name for the mountain is Bangjangsan, which means "dwelling place of esteemed monks." Jirisan's highest peak, Cheonwangbong (천왕봉, 天王峰), which means "King of Heaven Peak," rises to 1,915 meters above sea level, making it South Korea's second highest peak, after Hallasan (1,950 m), and the highest on the South Korean mainland, Jeonwangbong is surrounded by many other peaks over 1,000 meters, including Jeseokbong (1,806 m), Banyabong (1,732 m) and Nogodan peak (1,507 m), creating a view that looks like a sea of mountains continuing off into the distance. 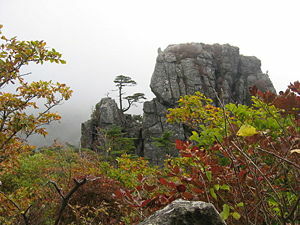 Another well-known peak is Samshin-bong (Three Spirits Peak). Jirisan is also considered one of the three most important mountains in South Korea, with Hallasan and Seoraksan being the other two. 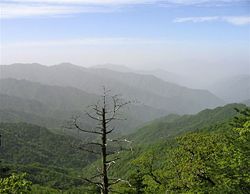 It is located at the southern end of the Sobaek mountain range (the Small White Mountains), and therefore also the southern end of the Baekdudaegan mountain range, the "spine" of the Korean Peninsula which incorporates the Sobaek mountain range and most of the Taebaek mountain range (the Great White Mountains). One of Korea's ten most famous temples, Hwaeomsa Temple is the largest and best-known among the seven major Buddhist temples on Jirisan, and contains many precious cultural assets, primarily stone artworks from about 600-900 C.E., including four national treasures. One of them, Gakhwangjoen (National Treasure no. 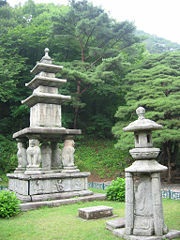 67), named by King Sukjong, is a three-story stone pagoda propped up by four lions. Also notable is the Gakwhangjoen seokdeung, one of the largest stone lanterns in existence. In addition, the temple houses six other registered treasures including Daeungjeon, the Dongseo five-story stone pagoda, Wontongjoen, and Hwaeomseokgyeong. Ssanggyesa Temple. This old temple located in the middle of southern Jirisan was built by the esteemed priest Jingamseonsa on his return from the Dang Dynasty about 1,100 years ago during the second year of King Munseong's reign (840). It was then destroyed by Japanese invasion but rebuilt by Jingamseonsa together with Songgwangsa and Hwaeomsa. Tea plantation on the slopes of Jirisan, in Hadong county, near Saangyesa Temple. There are many valuable cultural assets inside the temple, including Jingamseonsa-daegongtapbi (National Treasure no. 47) which was written by Choi Chiwon, a great Silla writer. There is also a five-story stone pagoda, Iljumun, as well as Palsangjoen, and Maaeyerae-jwasang. Not far from the temple is the beautiful Buril waterfall. Naewonsa Temple Naewonsa was built during the period of King Taejong Muyeol and at the time was called Deoksansa. It once prospered with ten small temples surrounding it but the entire complex was destroyed by fire 500 years ago. In 1959, a monk named Houng Wonjong rebuilt the temple and named it Naewonsa. In Naewonsa, two historical treasures remain: a three-story Silla stone pagoda and "Seongnamamsu Seokjo Birojana Buljwasang," (a stone statue of Buddha) designated as National Treasure No. 1,021. Beopgyesa Temple' Yeongijosa built this temple, at a higher altitude than any other temple in Korea, at 1,450 meters in the ninth year of King Jinheung (548), during a prosperous era in the history of Korean Buddhism. It is a two hour hike to reach the temple on foot. Along with Korean history, Beopgyesa has had its ups and downs. Its first ordeal was delivered by Japanese soldiers. Upon their defeat at the hands of General Yi Seonggye the Japanese soldiers set Jirisan on fire as they fled. In 1908, the Japanese delivered a second ordeal, burning it down again, a punitive measure against the region, which was renowned for its anti-Japanese protestors. 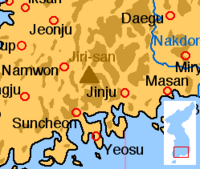 In October of 1948, Jirisan was occupied by a rebel army. A punitive Japanese force was sent to set fire to the region to expel the rebels. This incident became known as the third ordeal, giving rise to the saying that when Beopgyesa rises, the Japanese fall, and vice versa. In spite of the three ordeals, Beopgyesa has been rebuilt and an endless stream of believers visit the temple. Silsangsa Temple. 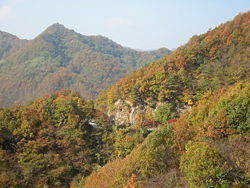 Silsangsa, situated in Sannaemyeon of Namwon at the lower edge of Jirisan, faces the Cheonwangbong peak of Jirisan, and was built by the monk Hongcheok during the third year of King Heungdeok of Silla (828). Considered a temple of defense of the fatherland, Silsangsa was burned to the ground during a great fire in Jeongyujaeran, and subsequently rebuilt with 36 buildings during King Sukjong's reign. However, another fire broke out late in the nineteenth century in the period of King Gojong, after which the area was again restored, albeit in a smaller scale. Baekjangam, a three-story pagoda, and many other national treasures remain, lending meaning and dignity to the temple. Starting from Cheonwangbong, the lower edge of the mountain spreads out like a folding screen in front of the temple, embracing it with the merciful heart of Buddha. The crystal clean waters of Banseon Valley originating from Jirisan run along the temple as if washing away the agonies of the world. The great Buddhist monk, Doseon, who lived near the end of the Silla dynasty, worried that the country's essential life energy might dissipate towards Japan through Cheonwang-bong. He therefore put his Japanese map under the floor of Silsangsa Bokwangjeon, and hit it whenever he worshipped in front of the statue of Buddha located there. This led to the saying 'when the spirit was high at Silsangsa, suffering came to Japan'. Silsangsa houses one national treasure, eleven provincial treasures, and one local treasure. Looking out from the Cheonwangmun gate there is a good view of Jirisan's highest peak, Cheonwangbong. The closest city to Jirisan is the historical city of Namwon, the setting for one of Korea's most famous folk tales, Chunhyangjeon, a story of love enduring unbearable difficulties. Namwon was founded in 685 during the reign of King Sinmun of Silla. During the Siege of Namwon in 1597 almost all of the city's inhabitants, as well as the Korean and Chinese soldiers who defending the city were killed by the invading Japanese troops. Reports as to the number of people killed in the siege vary from 4,000 to 10,000. Today, Namwon has a population of about 100,000, and hosts one of the oldest cultural festivals in Korea, dedicated to Chunhyang. Jirisan also contains six major valleys including Baemsagol and Chilseongyegok valleys, and many waterfalls, among which Guryongpokpo (Nine Dragon Falls), Burilpokpo, Yongchupokpo and Deungseongpokpo are the most spectacular. The mountain is also home to the Cheonghak-dong (Azure Crane Village) alpine valley, which includes the Samseong-gung (Three Sages Palace), a site which has been developed recently to celebrate one of Korea's foundation myths. 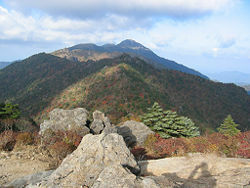 Samshinbong (bong means 'peak') is 1,284 meters high and a popular, but strenuous, day-hike from the Ssanggye Temple entry point (it is the closest major peak from this trail head). From Ssanggyesa, a trail winds up 2.3 km to Buril Falls. From the left turn in the path just before the waterfall, the track continues 6.9 km to the peak(for a grand round-trip total of 18.4 km). Starting from Ssanggyesa Temple, you can reach the peak in four hours at a steady pace. It takes about three hours to get down; it's an extremely steep hike. Bring plenty of water as it is not available beyond the temple grounds. Creeks in the vicinity are not safe to drink from without purification or filtering. Giardia lamblia, a water-bourne parasite, is found in South Korean streams, along with other parasites and pathogens. Other recommended hiking courses include the two hour hike from Seongsamjae to the Nogodan ridge, continuing on the the summit of Nogodan peak, recommended for summer hikers. Another good summer hike starts at Seongsamjae, passing the Nogodan ridge and continuing toward Hwaeomsa Templecourse, a trip of about five hours. To experience the beauty of autumn, a seven hour hike from Piagol valley to Imgeollyeong is recommended. Foliage and rocks on Jirisan. Hwaomsa Temple on Mt. Jirisan. ↑ Jirisan. Korean National Park. Retrieved November 10, 2007. ↑ Mt Jirisan National Park Tour. Tour to Korea. Retrieved November 10, 2007. This page was last modified on 8 May 2018, at 21:50.